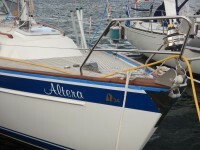 Last Tuesday morning we had Altera hauled out of the water as our part had come in to fix the transmission. As I am eager to get underway, I worked all day and by about 8:30 in the evening I had the transmission all back together and in the boat hooked up ready to go. The only thing that remained was to test it, glue a rubber flap on the bottom of the hull around the drive leg and put the prop back on. Wednesday I could barely move because I was so stiff and sore from all the awkward lifting and working spaces involved in making the repair, but I did submerge the drive leg in water and run the engine for two and a half hours to test if things were working properly and track down some of the glue needed to for the rubber flap as the chandlery had run out while the other part had been on backorder. Thursday I glued on the flap and started to put the propeller on. That’s when I discovered the nice little crack in the photo. This nut, really has one main purpose and that is to ensure the prop doesn’t fly off when the boat is put in reverse. 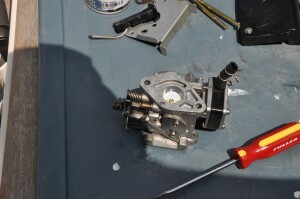 You can motor all day long in forward without it even being there… Anyway, probably best to catch it now rather then have my prop go flying off when I use reverse gear coming into a dock, but unfortunately it too is on backorder. So it could be here as soon as tomorrow or it could be a couple weeks from now. In the meantime, Chrissy took the chance to jet home for a few days in Cape Breton and I have plugged away at a few other items with Magnus keeping tabs on me. At some point I will post some details about some of the electrical upgrades among others that I’ve been working on for those that are interested. Today, Magnus and I went for a few dinghy rides to test the second rebuild of the dinghy carburetor. 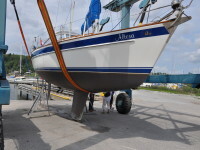 The first one was just a good cleaning to hope that the problems we had on our trip to the Parry Sound area could be fixed without the rebuild kit. While it ran fine at full throttle it was highly inconsistent at idle which I figured was due to internal fuel leaks. 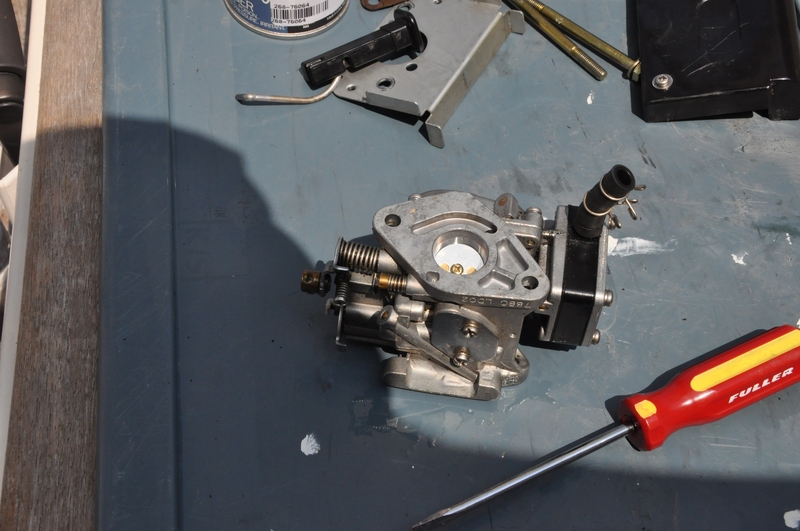 So Yesterday I took it apart again, cleaned it some more and replaced all the gaskets and the needle and float. Seems to be running well now and fingers crossed it stays that way. I just need to check how it runs cold now to see if I have the fuel mixture right at idle speed for a hot and cold engine. 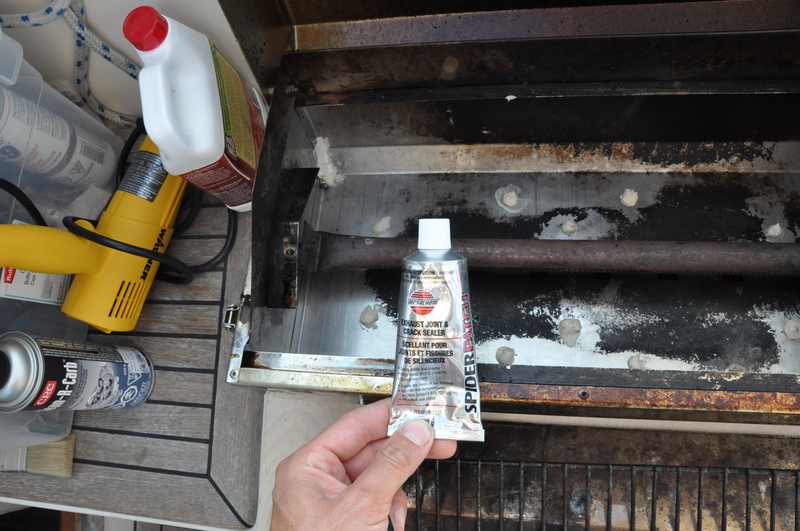 And my favourite solution so far this summer has to be the one I came up with to preventing the bbq from dripping grease all over the transom. 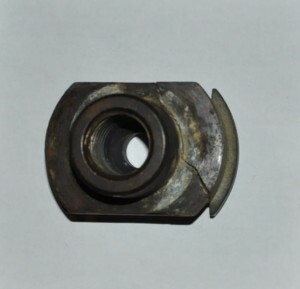 I had almost forgot about muffler crack sealant, the magic glue for teenage boys with their first car. 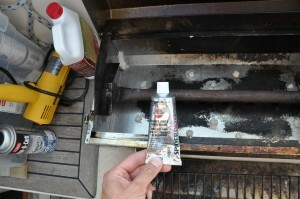 So far it’s working like a charm and the grease can only get out to the drip tray and not out of the corners. Anybody fancy a steak? I’m sure there are no toxins in the stuff.